Three articles published in the journal “Science” – you can read them here, here and here – describe as many researches on asteroid Ryugu. 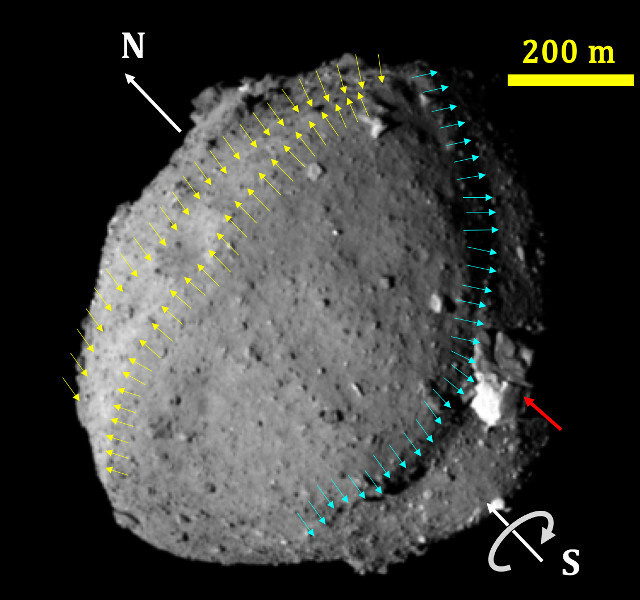 Three teams of researchers used the data collected by the Japanese space agency JAXA’s Hayabusa2 space probe to obtain the first precise descriptions of the characteristics of Ryugu and in particular its geology. The portrait that comes out is that of a porous asteroid containing hydrated minerals and at the same time very little water. It probably formed by a part of the debris of a larger asteroid that got destroyed. The Hayabusa2 space probe reached asteroid Ryugu, formally 162173 Ryugu, on June 27, 2018 with the ambitious goal of taking samples to bring back to Earth at the end of 2020 but that’s a part of the mission, which also consists of a close study of Ryugu with various instruments. The first results already offer a lot of information on this asteroid but leave some questions open. A team led by SeiIchiro Watanabe of Nagoya University among other things measured the density of asteroid Ryugu, compared by researchers to a spinning top due to its shape. Its mass was estimated at 450 million tons and the 1.19 grams per cubic centimeter are a low density indicating that this asteroid has a porous core. Its rotation speed was perhaps twice in the past and may have affected its shape. The researchers also proposed a possible site for the Hayabusa2 space probe to perform a second descent and a new sample collection. A team led by Seiji Sugita of the University of Tokyo is focused on topics such as the morphology and origin of asteroid Ryugu. The research also includes a study of various features of its surface but at one point focuses on its origin, probably from a larger asteroid that got destroyed after a collision with a subsequent accumulation of a part of the debris. An interesting result is the scarcity of water present, curious given that the analyzes indicate the presence of hydrated minerals that form in the presence of water. Perhaps the progenitor asteroid contained little water but perhaps it got lost as a result of its destruction sublimating because of the heat generated by the impact. A team led by Kohei Kitazato of the University of Aizu reported the results of infrared spectroscopic analyzes regarding the surface composition of asteroid Ryugu. This is the research that showed the greatest consideration for hydrated minerals, also in connection with the similarities with carbonaceous chondrites and therefore with a specific type of meteorites. The Near Infrared Spectrometer (NIRS3) instrument allowed to detect abundant materials containing hydroxyl (OH) on the very dark surface of Ryugu. Together with the dark color, it’s typical of carbonaceous chondrites that suffered thermal alterations, a possible consequence of an impact. Asteroid Ryugu has an orbit that intersects the Earth’s, just like Bennu, reached a few months ago by the NASA’s OSIRIS-REx space probe. The two asteroids are showing some similarities but also differences. JAXA and NASA are collaborating by sharing the data that their space probes are gathering to better understand these asteroids’ origins, characteristics and potential danger. Next Post: New simulations confirm the theory that Jupiter was formed much farther away from the Sun.